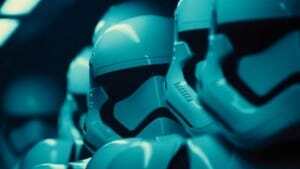 Star Wars Episode 7: The Force Awakens Runtime Revealed | Nerd Much? With Star Wars Episode 7: The Force Awakens being just a few months away, more details are surfacing as fans are in a rush to find out the latest news regarding the movie. The latest on the movie is that its runtime has been revealed. According to Following the Nerd, The Force Awakens runtime will be 136 minutes, meaning it is right in line with the rest of the Star Wars movies, which range from 121 minutes to 140 minutes in length. FTN notes that the source who gave them this information was the same one who gave them the information about the Batman v Superman: Dawn of Justice trailer debut (which just so happened to true), saying that they were “100% certain” that the information is true. In the same report, it’s also noted that the UK has given it a 12A certificate (basically the same as our PG-13). This is good news that goes along with the reports from last week that stated that Disney wasn’t going to ‘Disney-fy’ the upcoming sci-fi movie. For more on all things Star Wars, stay tuned to Nerd Much.